Justice Minister Tzipi Livni, who has been the Israeli negotiator in the peace talks with the Palestinian Authority (PA) since their initiation last July, announced Thursday morning that the fourth and final batch of terrorist releases has been officially cancelled. The release was meant to be carried out last Saturday but was put on hold, given the widespread protest of the unpopular move and the total lack of progress in the peace talks, which hit a dead-end in PA Chairman Mahmoud Abbas's refusal to recognize Israel as the Jewish state. The release of the last batch of 26 terrorists, part of the 104 total promised as a "gesture" to promote talks, was cancelled due to the unilateral requests by Abbas on Tuesday to join 15 United Nations agencies, in breach of conditions of the talks. 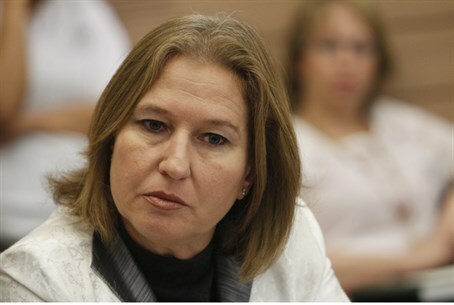 "New conditions have been created, and Israel cannot free the prisoners of the fourth batch," announced Livni. In response, the White House released a statement saying the move complicates the peace talks, "but despite that, the dialogue for peace in the Middle East remains open." Spokesman Jay Carney claimed "neither side has indicated that they want to walk away from the talks. They both indicated they want to find a way to move forward." The announcement comes after Livni held a meeting with PA Chief Negotiator Saeb Erekat on Wednesday night. Reportedly the talks included an “unprecedented” loud shouting match between the two, including threats and curses. US mediator Martin Indyk presided over the talks, and was forced to stop the talks several times in order to give both time to cool off – but to no avail, as the arguing and eventual shouting began almost immediately when the talks resumed. Livni reportedly threatened sanctions on the PA if it walked out of the talks, while Erekat demanded the release of 1,000 terrorists and a complete building freeze in Judea, Samaria and Jerusalem in order to continue talks. Reportedly, the talks lasted until 4 a.m., at which point Indyk had enough. US Secretary of State John Kerry, who initiated the renewed peace talks, admitted on Thursday that there was little he could do to save the process.